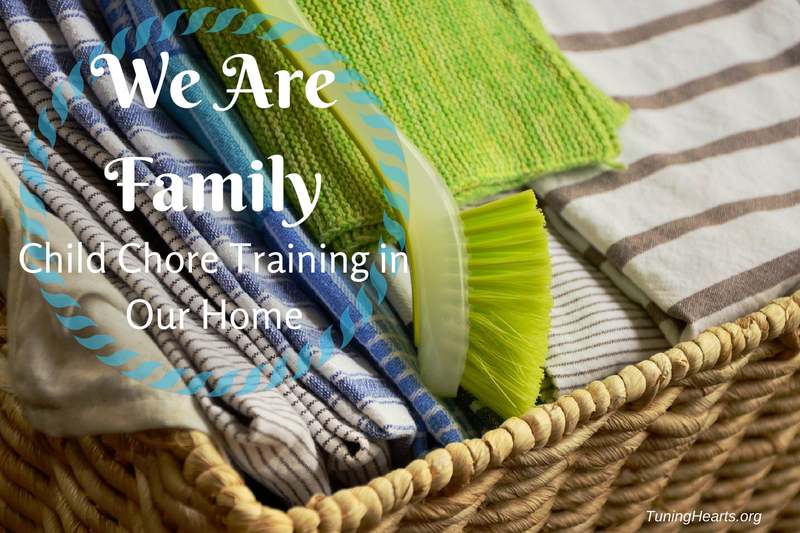 Last week I shared a little about how we started with teaching our children to be contributing members of the household by doing some simple chores. I thought that this week I would give a few more specifics about how this is currently working in our home. My 6 year old son has a few different categories of jobs to do every weekday. Saturdays and Sundays are usually chore-free days, although he knows that we may ask for help with special projects on the weekends. Each morning he has what we call his “Morning Routine.” These are things that are done before leaving the house or doing schoolwork. The Morning Routine includes making his own bed, getting dressed, eating breakfast (he never forgets that one, ha! ), brushing his teeth, coming his hair, and practicing the piano. To help him remember all these tasks, I printed up a visual checklist and laminated it, then taped it to his bathroom mirror. We took it down when we put the house on the market, so now I just have to verbally check in with him to make sure he remembers everything, but it has become pretty habitual for him now. He rarely even leaves his room in the morning without getting dressed and making his bed! #Winning! The chores that earn him money are divided into daily and weekly jobs. Daily jobs are simply to put away all his toys every evening, to tidy up his bookshelf before bed, and to make sure his dirty clothes get put into his hamper. He also is responsible for taking his dishes to the sink after every meal (we do not use a dishwasher, or else he would have to put them in there) and cleaning up any outside toys he played with when the weather is nice. Weekly chores are things that are different depending on the day or the week. Next week I will share how we are currently paying our son for his jobs and what he is learning about money through this experience, so stay tuned! If you are looking for more ideas on chores your kids can do, depending on their age, Pinterest or Google are your friends! There are several chore lists divided up into appropriate tasks for children from toddlers to teens! Will your kids be learning new ways to help around the house this summer?